Yoon Ha Lee has drawn on her Korean culture and folklore to create a wonderfully, unexpectedly grand tale set in outer space. When Min, a fox spirit and shapeshifter, hears that her brother Jun has been branded a deserter from the Space Forces, she goes in search of him. 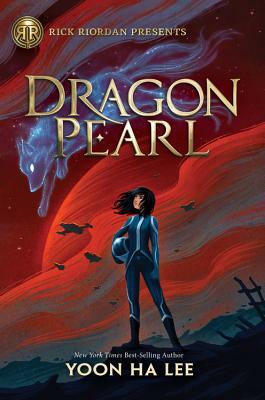 Jun is supposedly seeking the Dragon Pearl, an artifact that can build or destroy worlds. But Min knows in her heart Jun would never abandon his job and something is amiss. Deceptions and surprises abound in this lively book and I found it impossible to do anything but read, read, read until it was done! Min feels hemmed in by the household rules and resents the endless chores, the cousins who crowd her, and the aunties who judge her. She would like nothing more than to escape Jinju, her neglected, dust-ridden, and impoverished planet. She's counting the days until she can follow her older brother, Jun, into the Space Forces and see more of the Thousand Worlds. Min's quest will have her meeting gamblers, pirates, and vengeful ghosts. It will involve deception, lies, and sabotage. She will be forced to use more fox-magic than ever before, and to rely on all of her cleverness and bravery. The outcome may not be what she had hoped, but it has the potential to exceed her wildest dreams. Yoon Ha Lee (yoonhalee.com) is the author of several critically acclaimed short stories and the Machineries of Empire trilogy for adults: NINEFOX GAMBIT, RAVEN STRATEGEM, and REVENANT GUN. Yoon draws inspiration from a variety of sources, e.g. Korean history and mythology, fairy tales, higher mathematics, classic moral dilemmas, and genre fiction. Yoon's Twitter handle is @motomaratai.